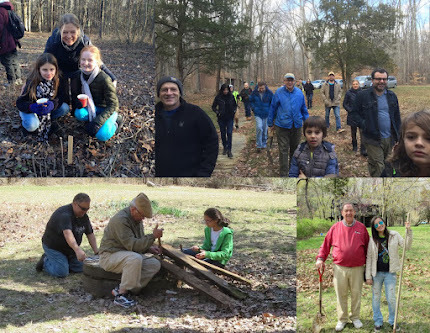 Through community support and a lot of volunteer effort, 2017 was a breakthrough year for the Friends of Herrontown Woods. Some key acreage was added to the preserve, the Veblen House and Cottage were saved from demolition, and important steps were taken to restore and improve the preserve's trails and habitat. Thanks to all who have donated time, skills, and resources to make these achievements possible. Please consider a year-end DONATION to support our work, and may the new year bring a steady supply of positive energy and joy. Convinced Princeton officials to accept a gift of land that expands Herrontown Woods by 7.2 acres. Completed proposal and cost estimate for repairing the Veblen House and Cottage. Rallied community support to stop imminent demolition of the Veblen buildings, and convinced town officials to acquire the buildings along with Herrontown Woods, from the county. Began meeting with town officials to work out an agreement for FOHW to begin repairs. Introduced visitors to previously unseen areas of Herrontown Woods by rerouting the blue and red trails through drier and more interesting terrain. Trails previously unaccessible during the wet season should now be useable year-round. More cutting of invasive shrubs, with new boulder-strewn vistas opening up in the preserve. Volunteers planted another pawpaw patch and some rescued hazelnut shrubs near Veblen House. Made the trail from the main parking lot up to Veblen House useable again. Volunteers pulled up invasive garlic mustard on the Veblen House grounds before it could go to seed. Made additional improvements to the trail map. Got to know the black vulture family that resides seasonally at the Veblen farmstead. Started clearing area for a botanical garden near the main parking lot. Hosted a girl scout troop for a workday. Hosted well-attended periodic nature walks, with 50 people showing up to learn about Herrontown Woods' magnetic rocks. Began building list of entities interested in using Herrowtown Woods and Veblen House. Maintained and expanded following on FOHW's Facebook page. Received an anonymous pledge of $25,000 over three years, and a $1000 donation from the Whole Earth Center. Added to our list of members. Posted additional historical research on the Whiton-Stuart family at VeblenHouse.org. Recovered some early history of Herrontown Woods a neighbor discovered a large binder with correspondence from a Herrontown Woods friends group from the 70s/80s.